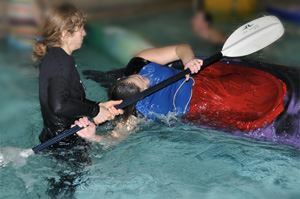 CWA sponsors pool classes which introduce the students to whitewater kayaking. Strokes, braces, the eskimo roll and safety considerations are all taught in these classes, unless otherwise noted. The following locations currently sponsor these classes and anyone interested in taking a class should note the exact dates, registration, and contact information. Most classes start in October and again in January or February, but few are offered in the summer but we are hoping that will change soon. This page should show the most current pool sessions available.